Look no further if you are serious about your fishing and appreciate the quality and craftsmanship that has become the trademark for Tiara. 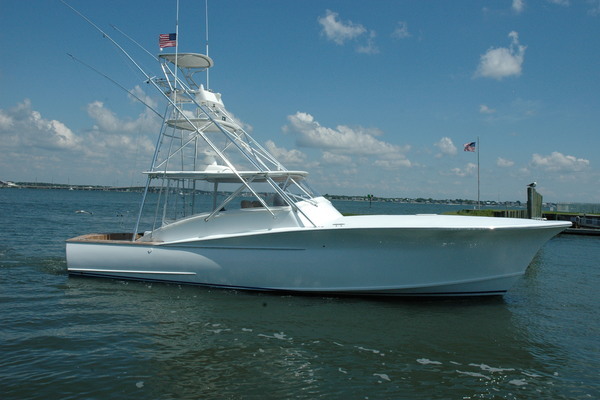 The 4100 Open is built on a beamy modified-V hull with a shallow keel and prop pockets to lower the shaft angles and reduce draft. Under the bridge deck is a full-size engine room with easy access thru cockpit. She has a spacious forward island-berth with plenty of storage and direct access to the head. Her galley has a full size refrigerator/freezer, microwave, 2-burner cook-top, double SS sink and over and under storage. Her spacious salon has a settee/dinette area, entertainment center and the main electrical panel. Her upper cockpit has a double-wide helm seat, L-shaped port lounge and icemaker. Her lower cockpit has all the fishing features you would expect in a Tiara including a tuna door, washdown, lockable rod storage, rod holder table, aft-facing seat and outriggers among others. She has a 9 kW genset and is powered by T 435-HP Caterpillar 3208’s with 1180 hours. Check out the Full Specs and give us a call to see Break Away.